Every two minutes someone in China commits suicide. On the country's most famous bridge, one man tries to stop as many as possible. Chen Si looks at Saturday’s newspaper. 'Another One Jumped Off the Bridge', reads the headline on page B9. Below the bold print, a photo shows the body of a 24-year-old who ended his life, according to the paper after his heart had been broken by a girl. He climbed over the low, steel barricade, looked at the muddy waters of the Yangtze below, and jumped. News like that doesn’t even make the front page anymore in Nanjing, the ancient capital of the Chinese empire. Each year,150 to 200 people come to this bridge to kill themselves. State media claim the span has overtaken the Golden Gate Bridge as the number one suicide spot in the world. On a balmy Wednesday in September 2003, Chen Si (44) took his daughter for a walk across the imposing Nanjing Yangtze River Bridge. At almost 5 kilometers long, four traffic lanes share the top deck with two sidewalks for pedestrians and motorbikes. On the lower deck, train tracks carry high speed and regular trains between the megacities of Beijing, Shanghai and Chengdu. Construction of the bridge was completed in 1968, when China was still a country of impoverished peasants. It was the first bridge crossing the Yangtze, China’s longest river. At the time it was also the longest bridge in the world carrying both trains and vehicles, an accomplishment which makes it the most famous bridge in China even after half a century. A lot more often, as it turned out. Chen decided to start patrolling the bridge every weekend. His first patrol was 19 September 2003. He hasn’t missed a weekend since, first patrolling on foot but since 2005 on a motorcycle to move fast whenever he spots someone who might jump. Each year 250,000 to 300,000 people commit suicide in China. That’s roughly 1 in 5,000 people. To compare: in the Netherlands 1 in 11,000 people ends his or her own life. Suicide is the most common cause of death among Chinese 15- to 35-year-olds. These are young people trying to escape the pressures of fast changing, contemporary China. Like the pressure to be number one in school and of being the only child in the family. The pressure to find good job, a suitable partner and the money to buy an apartment - which is unaffordable for the vast majority of twenty-somethings. The pressure to take care of aging parents, as society demands. Recently Chen ‘celebrated’ another anniversary of his weekend job as a watchman on the bridge. He did this by doing what he has been doing ever since early this centrury: by riding his motorcycle across the bridge, from sunrise to sunset. To get to the top deck of the bridge takes 140 steps of a dark staircase in one of the vast pillars of the bridge. Twenty steps up, turn, next twenty steps, repeat. Each turn gets you further from the ground and, for the many who had the intention, closer to the fatal fall into the river. Over the years, Chen has saved hundreds of lives. Like those of Zhang and Wang, two teenage girls he spotted recently. Both came from the poor province of Anhui in Eastern China. They had been working for six months in a factory on the northern shore of the Yangtze River. Now they wanted to go home to help out with the rice harvest. The girls, refusing to leave the bridge, were eventually taken away by the police. Alive. Chen writes about all his experiences on his web log. It has earned him national fame. People with a heavy heart from all over the country now try to get in touch with him. 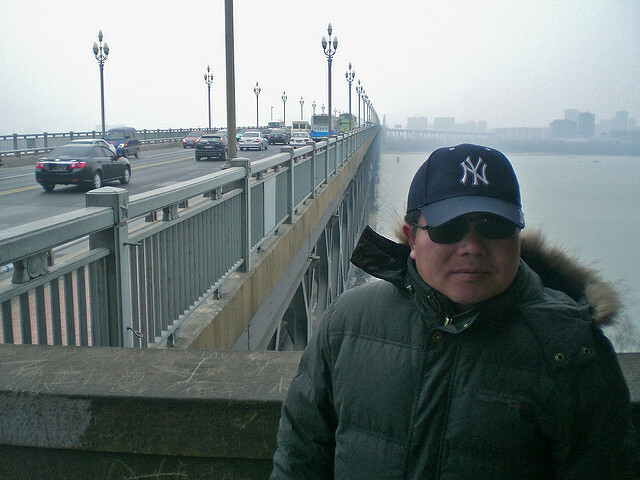 Since 2003, Chen has given advice in person to over 7,000 people, not including his work on the bridge. He also spoke on the phone with over 16,000 people and even comforted 51,000 people via text message. So far, his volunteer work has cost him 232,000 yuan, mostly from renting the apartment and buying gas for his motorcycle. Only part of this money is covered by donations. His regular job at a transportation company earns him 2,600 yuan a month, which he needs to take care of his wife and daughter. Chen pulls his fur-lined coat over his blue New York Yankees cap. A cold wind haunts the high bridge. Even though the skies are grey, he wears sunglasses. “To protect my eyes from the sand that the wind blows up from the river,” he shouts, to make himself heard over the noise of the traffic and trains underneath. One thing is certain: the Nanjing Yangtze River Bridge is no place you visit for fun or great views every weekend. The man on the motorcycle turns out to be using his cell phone. No case for Chen. Not that the missed rescues don’t haunt him. Chen leads the way to a small, windy restaurant at the foot of one of the bridge’s pillars. It’s nothing more than a badly lit gathering of a handful of campsite tables and low, plastic stools. Food is served in styrofoam trays. Chen takes a sip of baijiu, strong Chinese liquor. Against the cold, he says. But it helps numb other feelings a bit as well. He puts his glass down. He will need a lot of boosts like that once spring arrives. That’s the unfortunate season when most people climb those 140 steps in those dark pillars up the bridge, with only one way down in their heads. Down and out.